CM Magazine: Lean Mean Machines. Michele Marineau. Translated by Susan Ouriou. Calgary, AB: Red Deer Press, 2000/1998. Fifteen-year-old Jeremy is confused. He is confused by Tanya, his longtime friend who suddenly becomes cold, aloof and dismissive. He is confused by Laure, the new girl who has taken over his spare locker at school and treats him like a dirty pair of gym socks. But he is also intrigued by the frequent fear and doubt he glimpses in her eyes. What made her to transfer from the prestigious Great Pines Academy partway through the school year? Why does she snub those around her like she is better than they are? Why does she leave school each day with the snobbish Mathilde and Anne-Sophie, walking all the way to their posh neighborhood only to retrace her steps after bidding them farewell? Why does she avoid her new friends on weekends, pretending to escape to the country to her d-i-v-i-n-e boyfriend Fabian and her beloved horse Caramel? Why does she surprise Jeremy in his own kitchen one Saturday, without makeup and wearing tattered clothes? As Jeremy slowly untangles the mysterious web that envelops Laure's past, he begins to see beyond the facade she has created for herself. But he must tread carefully or risk losing Tanya's friendship altogether just when he realizes it is changing into something more. 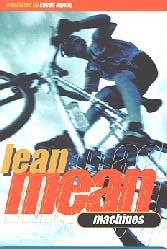 Originally written in French by award-winning Montreal native Michele Marineau and published under the title Velos n'ont pas d'etats d'ame, which received an honorable mention from the Prix Alvine-Belisle, Lean Mean Machines is a story of friendship and earned trust amidst teenage anguish and despair. It is not a sports story, as the cover might indicate. Indeed, the cover may discourage some readers from reaching for it, a deterrent that would be to their loss. Most teens will not experience a world turned upside-down to the extent that Laure does in this novel, but they will certainly relate to her problems. As in the Governor General's award-winning The Road to Chlifa (1995), Marineau and English translator Susan Ouriou have once again teamed up to create a teen novel with a heroine that will inspire readers to find inner strength to resolve their own problems and a hero whose unswerving friendship reinforces that struggles need not be born alone. Carole Marion is the Youth Services Librarian at Calgary Public Library. Her responsibilities include coordinating the system's two annual reading games and author visits for children and teens. She has been working with youth and their caregivers for over fifteen years.